About 18 months ago, I got a Harley-Davidson press release about a big birthday bash they were planning in Rome. I RSVP’d right away. Trouble was, that bash was not scheduled until 2013! Oops. 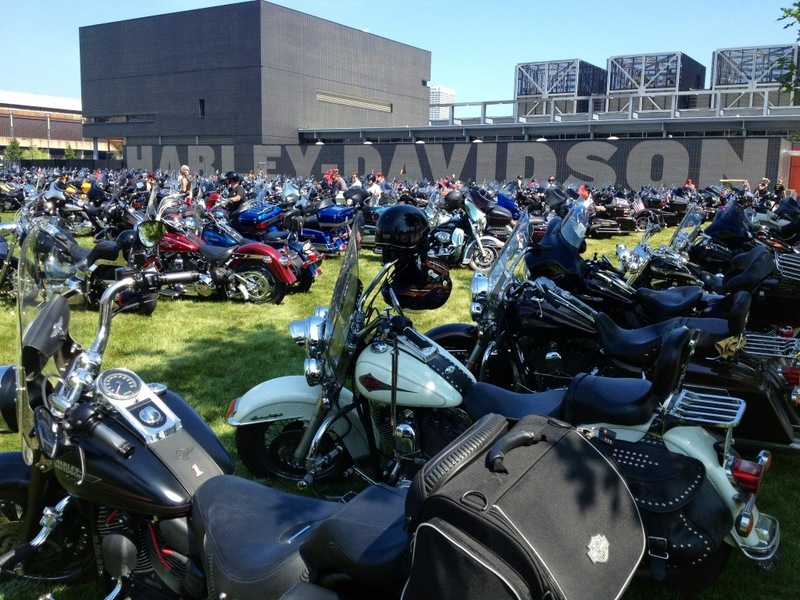 When Harley has a party, like their 110th anniversary birthday bash which is peaking this weekend in Milwaukee, they apparently like to get the news out early. 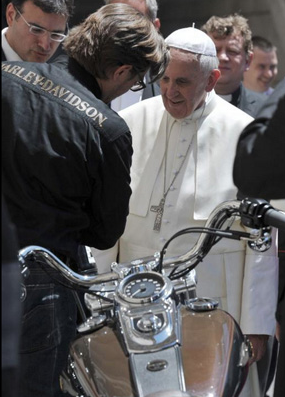 Pope Francis blesses bikers in St. Peter’s Square. 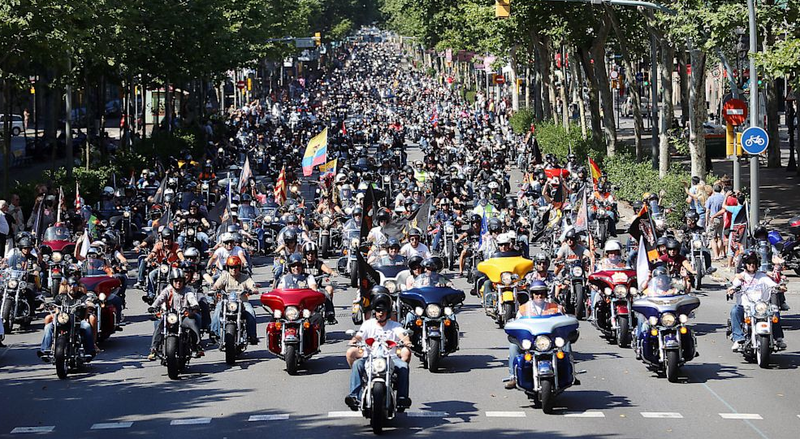 A decidedly different demographic was expected for the climactic wind-up of the three-month-long, celebration, party and ride that circled the globe, at the iconic bike maker’s Milwaukee headquarters. The Motor Company’s official festivities kick off Thursday, and span the weekend. But the party doesn’t quite end then; local dealers have announced “after-party” sessions that will continue past Labor Day. Yes, there’s a 110th anniversary logo! It’s an opportunity, the gleeful local of Chamber of Commerce reminds folks, to come and get immersed in Harley-Davidson’s heritage, present and future. And it is more than a celebration of chrome, leather and loud exhausts, there’s plenty of food and music on the docket. Among the musical highlights are concerts by Toby Keith, Aerosmith, Kid Rock and other acts at the Summerfest and Marcus Amphitheater festival grounds. At the Harley-Davidson Museum, there is an “after dark” acoustic lounge in the Motor Bar & Restaurant with live acoustic music (headbanger music might shake some of the museum displays apart!) Thursday through Saturday. Most of those activities require admission, not surprisingly, but if you are looking for “free” there are factory tours and demos of Harley-Davidson’s 2014 model lineup at the company’s powertrain facility (on Pilgrim Road in Menomonee Falls) from Thursday through Saturday. Street parties were to be held each afternoon Friday through Sunday (locations: E. North Ave., Milwaukee St. and Juneau Ave.). UFC fans can watch a championship event (location: BMO Harris Bradley Center) on Saturday. The visual highlight of the whole thing is likely to be the official parade on Saturday (starts at 10 a.m., beginning at Miller Park and running along Wisconsin Avenue. It ends at the Summerfest grounds.). Expect a procession of bikes several miles long. If you want more information, there’s an app for that. Yes, there really is. Visit Harley’s 110th anniversary website to find the app and check out some other information. Any day now, I expect to be getting some information about the 111th birthday bash. « On The Road: New Life for Dead Wood?